The Golden Age program is geared specifically towards the seniors citizens (age 55+) of our community who may need social support and avenues to remain engaged within the community. Our weekly Saturday morning breakfast program (excluding Ramadan). We start at 8:00AM with a light exercise activities followed by breakfast. Breakfast must be eaten on site and purchased from Cafe Al-Rahmah at a cost of $3 per person. Seniors must register through Golden Age Committee for the breakfast and dinner programs. 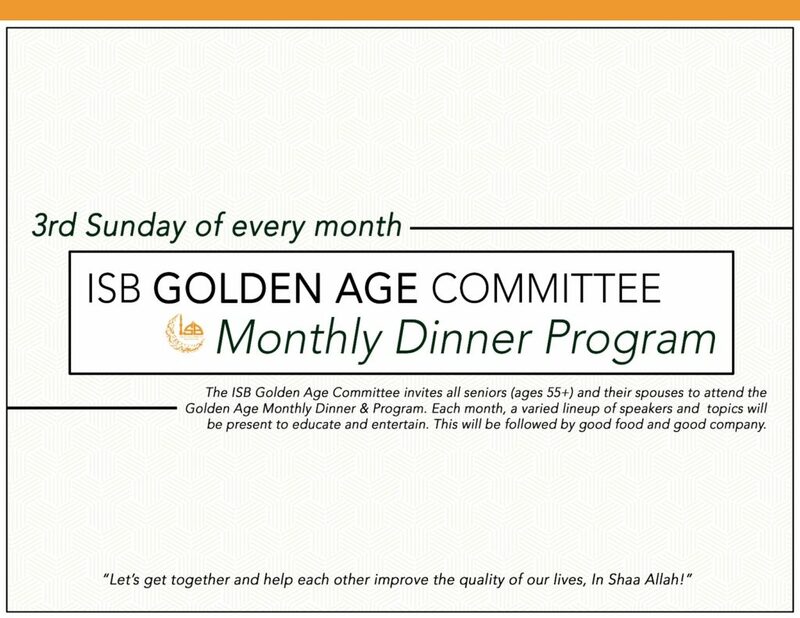 Our monthly dinner program, on the 3rd Sunday of every month (excluding Ramadan). The event consists of a meet-and-greet, presentations on various topics by guest speakers and topic experts. Finally, the event ends with a delicious dinner. This program is one of many activities organized by the ISB Golden Age Committee in cooperation with the Baltimore County Department of Aging. For more information, please contact the Golden Age Committee using the Contact Us page.